All prices indicated are excluding VAT. VAT is shown at the Shopping Cart stage where it is inclusive of VAT at current rates. Our Shopping Cart will display product prices and delivery with and without VAT. VAT rates are correct at the time of entering information. Postage for small packages will normally be by First Class Royal Mail. The postage price includes packaging costs and the base price is £4.50. There may be additional charges for the Highlands, Islands and postcodes BT (all), HS (all), IV (all), KA (27-28), KW (all), PA (20-49), (60-78), PH (17-26), (30-44) (49-50), ZE (all). Ordering more than 1 item may attract an additional incremental cost of between 10p and 40p. You will see the postage cost clearly indicated at the checkout. All fittings orders received before 2pm will normally be dispatched on the same day, and delivery takes 1 to 2 days, this does not include weekends where orders will be dispatched first thing Monday morning. An option for first class recorded delivery is also available with a base charge of £6.50. Next day signed before 1 is also available for a base charge of £9.50. This option can only be guaranteed for mainland UK locations. For larger orders we use a national courier service. All tanks and larger items ordered before 11am will normally be dispatched on the same day, delivery costs vary. We also offer a next day delivery service if you order before 11am which operates Monday to Friday. Friday orders are delivered on the following working day, Monday. There will be additional charges for the Highlands, Islands, some London postcodes and postcodes BT (all), HS (all), IV (all), KA (27-28), KW (all), PA (20-49), (60-78), PH (17-26), (30-44) (49-50), ZE (all). To discuss these rates, or to inquire about quantity/bulk orders please email or phone. 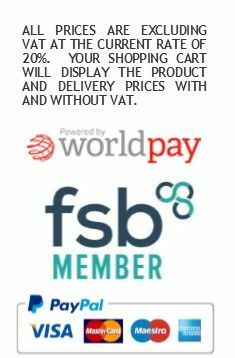 We do not currently sell internationally from this e-shop, but if you want to discuss an international order, again, please email or call. A note on fitting sizes. BSP sizes are given in inches. BSP stands for British Standard Pipe threads. Please note these sizes are for the pipe the fitting attaches to, and not the fitting itself. Therefore the real measured thread size of the fitting is not the reported BSP size. For example, a 2 inch BSP male thread measures approximately 2 1/4 inches (~ 6cm). 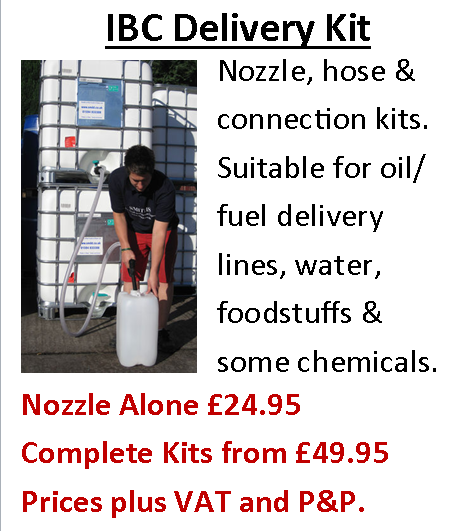 Details of IBC sizes are given on the IBC product page.